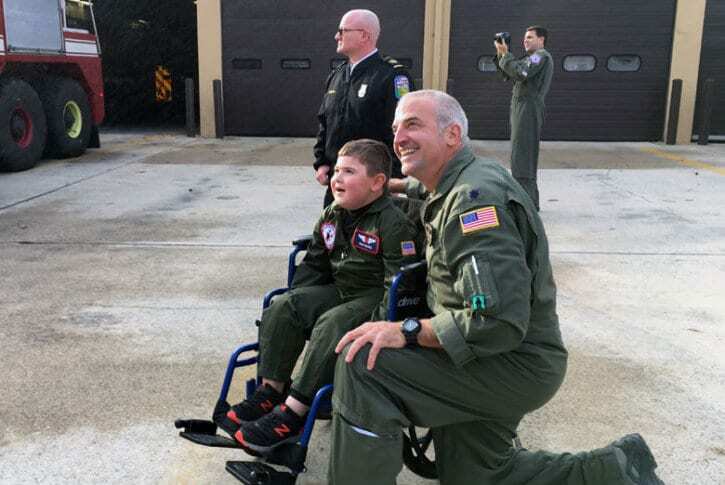 A Severna Park boy who recently lost his ability to walk wrapped up the month of November with the experience of a lifetime as Pilot for a Day. See photos. Nine-year-old Ryan Bianco, who is battling Duchenne muscular dystrophy, had a full Friday, which started with an opening ceremony in the morning. “We swore him in as a pilot for the day. We pinned him on with a general rank,” said Check-6 Foundation Founder Col. Rob Balzano. He told WTOP that made Ryan the highest-ranking person in the room that day. The event, which takes place at Andrews Air Force Base, is meant to help provide inspiration and hope to children who are seriously ill. The Check-6 Foundation, helps provide support for the Pilot for a Day program at the base, and it provides assistance to military veterans who need it. “We can’t undo what’s happening to these children, but our goal is to try to replace those bad memories and all the tough challenges with all the good memories of the day and here on out,” Balzano said. Ryan and his family accompanied him throughout the day. Ryan got to fly in helicopter and F-16 simulators, and he saw demonstrations from the base canine security squadron and fire department. He also wore a personalized flight suit. The personal touch didn’t stop there. “Having his name on a bunch of aircraft was pretty cool,” said Ryan’s dad Mike Bianco. “I am just blown away, you know, [by] the amount of fun activities that were planned for Ryan,” said his mother, Chrissy Bianco. In addition to all of the demonstrations, Ryan received lots of gifts. He got a personalized cake decorated with the colors and logo of his favorite football team — the Baltimore Ravens — and an Apple Watch courtesy of charity Fischer House. He also received a special video message from Maryland Gov. Larry Hogan and a framed letter and photographs from President Donald J. Trump and First Lady Melania Trump. After the day’s activities at the base, Check-6 surprised the family with dinner and a hotel stay at National Harbor and tickets for a ride on the harbor’s Ferris wheel. The foundation also gifted Ryan’s parents with a check to cover their mortgage for one month. Ryan’s sense of humor and outlook on life seemed to make an impression on his new friends. “Ryan is truly larger than life. He’s a person that commands a room,” said Lt. Col. Dave Earhart, a Check-6 Ambassador and, now, Ryan’s wingman for life. “Through thick and thin, I will always have your back,” Earhart assured Ryan during the closing ceremony.